By now, the cat’s out of the bag on Ionic Creator, our upcoming drag-and-drop development tool for building beautiful hybrid apps with Ionic and AngularJS. For those that have been following our company‘s history over the last few years, you know that we have a passion for making development simpler and faster through visual dev tools. Our previous two products, Codiqa and Jetstrap, have served over 250,000 developers all around the world, and we are really proud of the impact they’ve had on the development world. We built the Ionic Framework because we weren’t happy with the underlying frameworks back in 2013. We felt there was a huge opportunity to build better foundational technology for the next generation of mobile app development, and that became Ionic. Today, I am happy to formally announce the Ionic Creator to our community. Let’s take a look! Creator comes with practically all of the Ionic UI elements we offer in the framework, including support for tabs, side menus, slide boxes, modals, and forms. And adding them to your app is as simple as dragging them right where you want them. Pages can be linked to create compelling navigation, and the elements can be easily moved and deleted. We want to make it easy to build pages based on a common design, so you don’t have to start from scratch each time. We have a set of quality templates for building login and signup pages; tabbed interfaces; Google Maps pages; and more. We will be adding a ton more templates in the future, with the ability to create and submit your own! 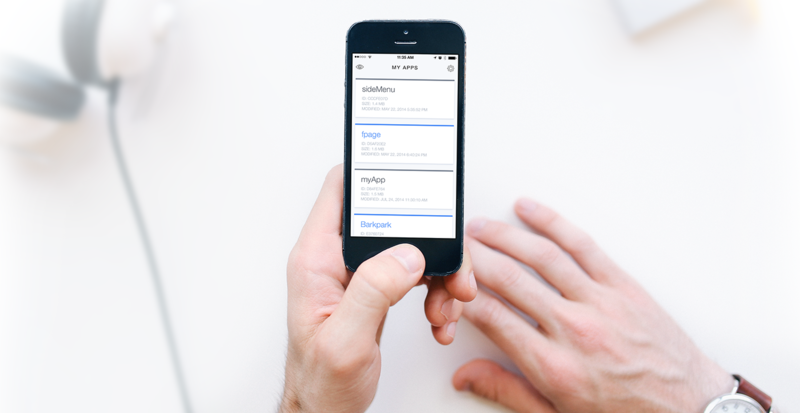 With just one click, you can download a ready-to-go Cordova project with your new UI. You can even start a new project from the Ionic CLI tool, using your Creator app as a starting point! In the future, we will be adding the ability to build ready-to-go native iOS, Android, and Windows Phone binaries right from Creator. With the upcoming Ionic View app, you’ll be able to rapidly test your Creator apps on your device and share them with anyone around the world. Scan or enter a code, and you’ll be running a real app in seconds. Best of all, your coworkers and clients can test it, too! The dream of the Ionic Creator is to make it easier to build, test, and share ideas for your next great app and get started on development faster. It’s not a replacement for development, but it accelerates your development. To make this dream a reality, we knew the Creator would have to export code that was indistinguishable from hand-written code and maybe even better. Our years of experience building drag-and-drop tools has given us a lot of experience in clean code generation, and Creator has benefited immensely from this. All Creator apps export clean Ionic and AngularJS code, complete with routing and some initial configuration and controllers set up. It’s ready for you to jump right in and add your magic sauce. We want to help more web and mobile developers become hybrid developers with Ionic. Having great tools like Creator will lower the bar for getting started with mobile development in general, and we love that! To achieve this dream, we have decided to offer a totally free dev plan. For users that need more projects or want to create teams, we have paid plans with higher levels of service. We will always have a free version of Creator available, so you can quickly build Ionic and Cordova apps whenever you need to. We aren’t quite ready to release the Creator, but we hope to have a beta out by the end of August/early September. To be the first to try Creator, make sure to sign up on the Creator email list, and watch your inbox for updates. In the last two weeks, we’ve had 10,000 people sign up for the beta, and it’s clear people are excited for Creator. We are so excited and anxious to show you what we’ve been working on.